A listing of D&D specialists with contact information. The specialist directory module is an index of D&D experts. The directory stores the contact information of all the D&D community members who have registered as a D&D expert, along with their areas of expertise. D&D experts from the user community are encouraged to register as part of this specialist directory through the “expert registration” link. New registrations will be reviewed by the website administrator prior to approval. The specialist directory allows users to find a D&D expert through the search criteria by entering his/her name or the area of expertise into the search field. The results provide contact details, such as name, address, phone number, organization, email, discipline, and areas of expertise. 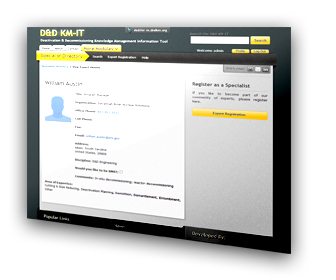 The information provided in the specialist directory module is a preview of the D&D expertise supporting D&D KM-IT. Visitors of this system are encouraged to send a question for these specialists via the Hotline module. In addition, the data provided is for information only and should not be used for marketing purposes. Inclusion does not constitute an endorsement of any particular product, service, or vendor by FIU or the United States government (see full disclaimer here).